Let me start by making it clear that this is Not Cassoulet. The New York Times published a recipe for Cassoulet the other day, which I read as I settled into staying safely in and watching the Blizzard of ’16 drop more than 2 feet of snow outside my window. The recipe was all about cassoulet as made by a Great Chef, simmering dry-rubbed duck in fat to make confit immediately before cooking it with the right sausage in the right beans with the right seasoning, the whole thing being a marvel of complexity. As befits one of the Great Dishes of French Cuisine. Now, don’t get me wrong – prepared that way it truly is a marvel. If you have a chance to eat cassoulet made by a great chef (or better still, in an auberge in the Languedoc region of France, where the dish originated) seize the opportunity and savor it. If you ever have a day to spend fiddling – and a quart of duck fat sitting around – have at the recipe. But… Cassoulet is named for the earthenware pot it was traditionally cooked in, which translates as – wait for this – casserole. It was not created in the extensive kitchens of the Great Chefs who developed the Classic Cuisine of France, but at the hearths of thousands of Bonnes Femmes – homemakers – in rural Southern France, on cold winter days when they did not have access to the bounty of fresh produce they loved to cook. On a cold blustery day, a bonne femme would come into her kitchen and stir up the fire. She’d want it burning well all day, in this weather… There were already a few scoops of white beans soaking in water, so she freshened them and put them to simmer. But what would she cook with them? She pulled her shawl snug and went to the cold larder, where she used a long fork to pull some poultry (duck or goose, usually, chicken was expensive) out of a crock of cooked meat carefully covered with fat to preserve it (confit – before vacuum sealing) and took down a link or two of smoked sausage, or perhaps cut a slice of dry cured ham. These weren’t Gourmet Ingredients – they were the way to keep meat all winter. Cooking them with beans would both flavor the beans and stretch the meat. She continued into the root cellar for onions, garlic, and a few turnips or celery roots. And there you have the foundation of the classic cassoulet – at the hands of a prudent homemaker who Planned For Meals. When I went into the kitchen to start lunch, I chopped the bacon, and set it in a heavy pan over a very low flame, to render out the fat. And I put another quart of water in the beans, and a light under them. (And I heated our lunch – this doesn’t all take much time if I’m in the kitchen anyway – as the bonne femme would have been.) Then I chopped an onion, peeled a whole head of garlic (but didn’t cut it) and put both aside. When I went back after lunch, I put the onion in the pan with the bacon, keeping the light very low. If I’d had fresh celery, I would have added that, too – mine was already sauteed, so I held it until later. At this point, almost everything went in the pot. Ham and chicken, onions in bacon with all the lovely flavorful rendered fat, sauteed celery, all simmered together with a lid half covering it until the beans were thoroughly cooked, but not falling apart. This is not a soup, or even stew, so no more water, but I did keep a close eye on it to make sure it didn’t dry out – and the simmer was as slow as I could get it. (At this point, if it makes sense for you, you could move an oven proof pot into a slow oven, and it will take less watching. There’s a reason that’s the classic method!) The very low heat also allows the beans to soften completely without getting mushy. 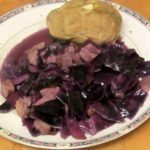 When the beans were cooked, I let it cool a bit, fished out the sprigs of herbs (the twigs, actually…) Then noticing that it needed some more vegetable, I chopped 2 cups of cabbage, added that, and simmered until it was cooked. Added a little salt (taste – how much you need to add will depend on how salty your ham and bacon are.) And at any point during the process you can turn the heat off and let it sit a while to meld flavors, if it will be ready before you want it. “In Languedoc, the way in which the cassoulet is made varies according to whoever is preparing it.” Larousse Gastronomique, ©1961. Who am I to argue with Larousse Gastronomique? Not Cassoulet - but closely related. 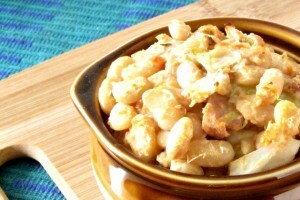 White beans with cured meat and root vegetables melted into them for flavor and richness, perfect on a cold, snowy day. 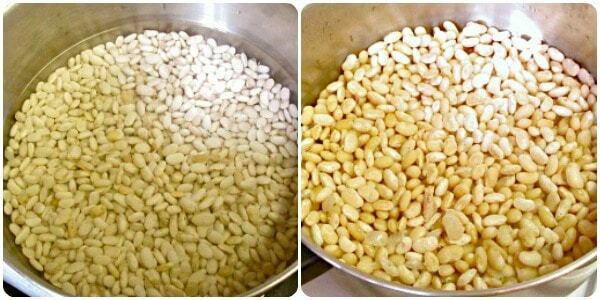 Either soak beans overnight, or parboil, then soak them one hour, in one quart water. Place beans in pot with soaking water, and one more quart. Bring to a boil, then lower heat to a very slow simmer. Chop bacon, put it in a heavy, cold fry pan. Place pan over very low heat, and let bacon render out the fat - half an hour or more, over the lowest possible heat. Chop a large onion, add to the bacon, and stir. Dice celery, and add it, stir. Continue to let it cook over very low heat, to allow onion to soften, not brown. 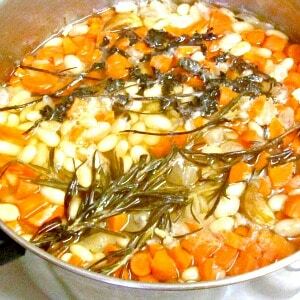 Add whole peeled garlic cloves, chopped carrot, and herbs to the pot of beans. Continue to cook at a very low simmer. 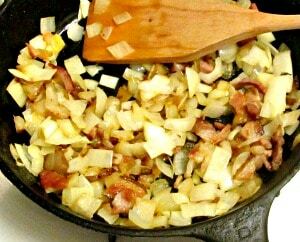 After half an hour or so, mix all contents of frying pan - bacon and bacon fat, onion, and celery - into the pot of beans. Add chicken and ham. Continue cooking over very low heat. When beans are fully cooked (but not falling apart) remove from heat, let cool slightly (if time permits) to let the flavor meld. Remove any tough bits and twigs from the herbs. 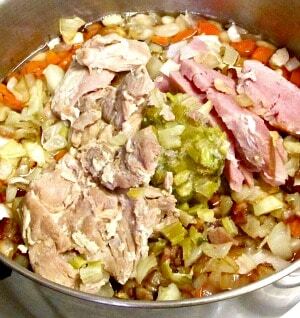 Return to heat, add cabbage, and salt to taste. Once cabbage is cooked, serve. WIAW 100 – a Milestone! We couldn't believe it either! And then it all melted away... And thanks - I was glad, too. love the historical intro, never heard of this dish!I think it can healthy despite the amounts of fat, well done! 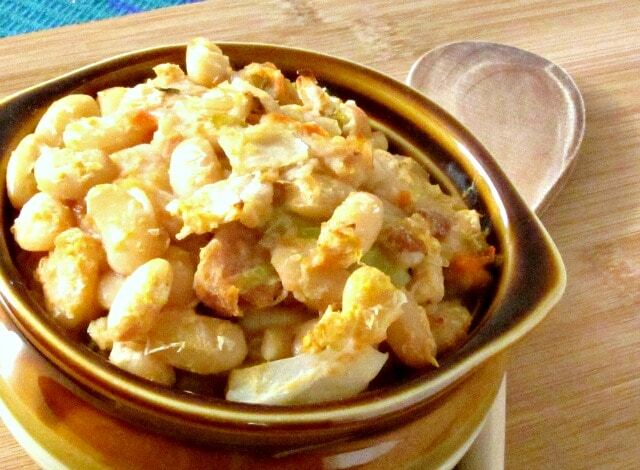 Cassoulet is a very traditional French dish - but not originally in the Classic Cuisine of Great Chefs so it tends not to turn up in many of the cookbooks. But I'd just seen an elaborate recipe for it, which made me think... And the fat in the bacon (or confit) is balanced quite a bit by the beans. In fact, in cold weather it gives the beans more staying power than you'd have from a lowfat dish - there's a reason that many of the higher fat traditional recipes are winter dishes in Northern climates! (Not needed much now with central heating... but that's pretty new, in human history.) And if you're not trying to reproduce the richness (as I was) or you are cooking for someone who needs a very low fat diet, it's easy enough to drain the bacon fat, which is the only major source in my recipe. And of course, since my point is to use what you have on hand, any sort of cured meat, or flavorful sausage will work beautifully! I love getting snowed in when good food comes out of it. :) We haven't had the snow that you had which really isn't normal for us, so I sort of envy you the snow day! Sounds like a very comforting and warming meal to have in the midst of a blizzard! Oh - you're North of us. Well, yes, this weather would be more normal for you than for us! (Second deepest snowfall since they started keeping records - no, this wasn't normal...) It's really mostly melted by now, though, so on the whole it wasn't too bad. It was certainly an inspiration to cook a dish with only what I already had on hand, though. And sometimes those challenges give you the best ideas! Glad you liked the sound of it! I absolutely love your sense of humor and the great history of this dish! LOL - well, thank you! Everything is better with a little laughter on the side, and I really can't be too solemn in a kitchen. (Serious, sure - it's different.) Yes, there is a purpose to the exact reproduction of a historic dish - I've done that - but not when I just want Sunday dinner. There is a time and place for everything. This was not the time and place to pretend to make confit. Thank you! I must say, I'm not going to wait for a blizzard to make this again myself - it was much too good! 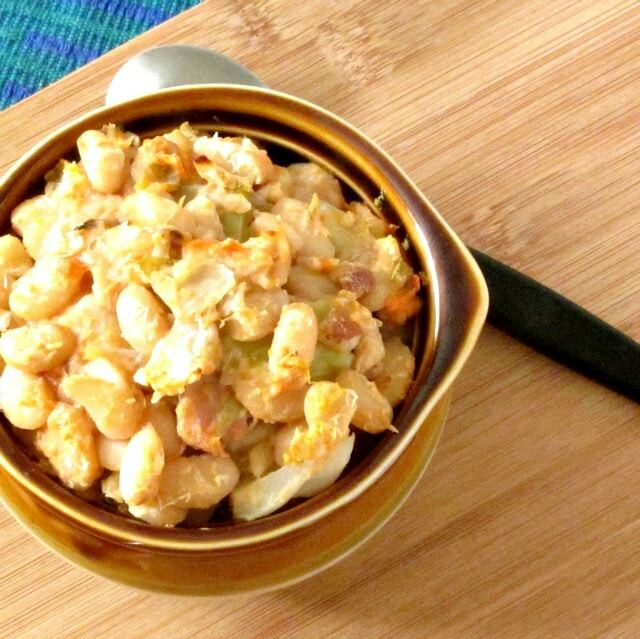 Sounds like the perfect comfort food to cook for a blizzard! Fascinating dish and the history behind it is even more so. I loved your story about cooking it in a blizzard too! How aptly named!